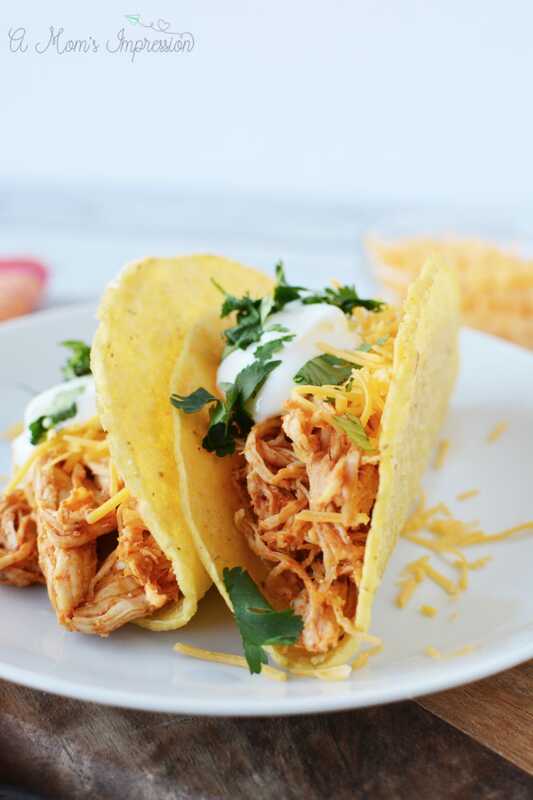 This easy Instant Pot Chicken Tacos uses shredded chicken and taco seasoning for a delicious and quick meal. Place chicken in taco shells or for a low-carb option, create a taco bowl. Taco Tuesday will never look the same again. We are constantly looking for good recipes for chicken breasts to use in our pressure cooker. The Instant Pot has become a staple in our home and we use it at least 3-4 times a week. It is so nice for families because it is a one pot cleanup and I can leave it and finish doing something else. It is really nice for those busy nights where we are doing a billion things. 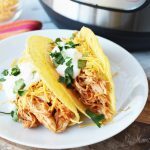 These Instant Pot Chicken Tacos are a favorite in our home. The kids absolutely love them and they are so simple to make. Some of our most popular recipes here on A Mom’s Impression have been our Chicken Instant Pot recipes. I don’t know about you but I always end up purchasing the big family pack size of chicken breasts on sale at the store so it seems like we constantly have it in our fridge or freezer. 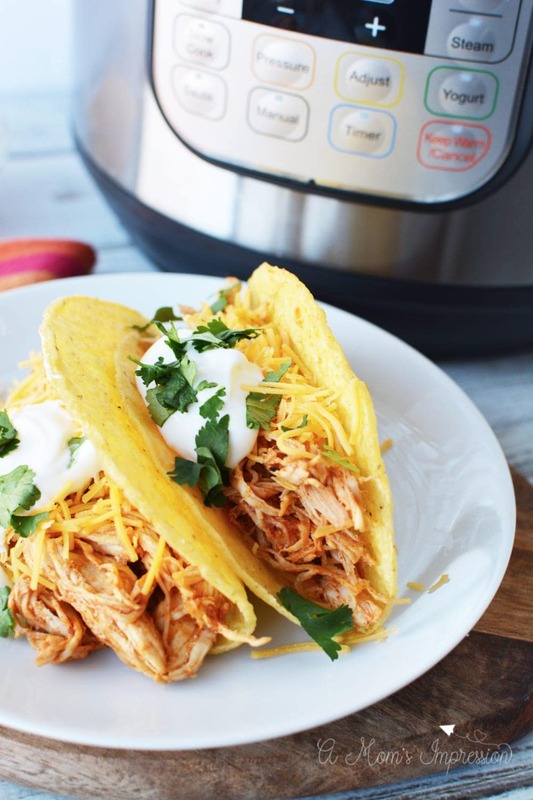 It is so nice to just take it out and make shredded chicken in our pressure cooker or Instant Pot taco chicken for the week. 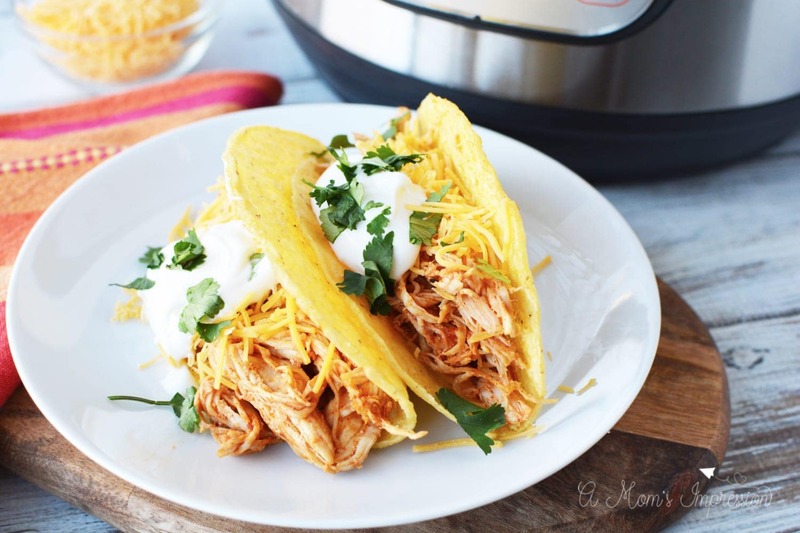 How do you make shredded chicken in the Instant Pot? My husband and I love to have shredded chicken on hand during the week. We put it on salads, use it for a quick chicken quesadilla, or to make soups. It is really nice to have it sitting there in the fridge. We usually make it on Sunday while we are meal prepping for the week. 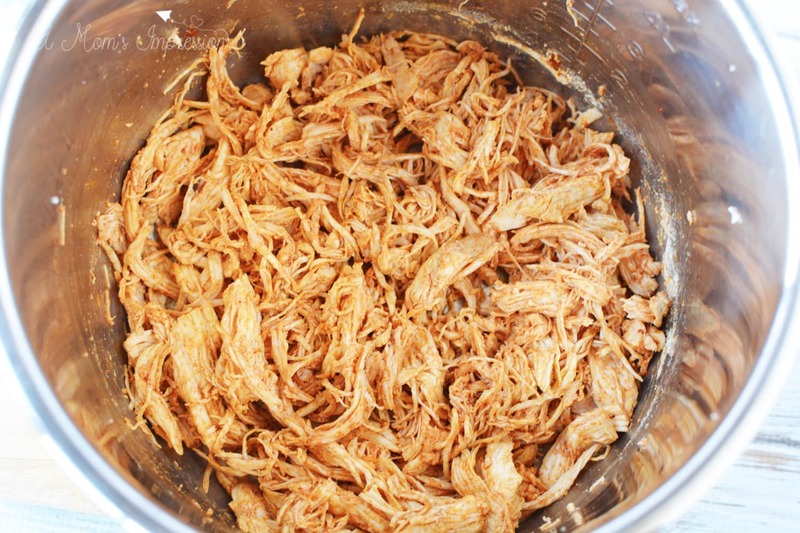 Our favorite way to make shredded chicken is using our pressure cooker. 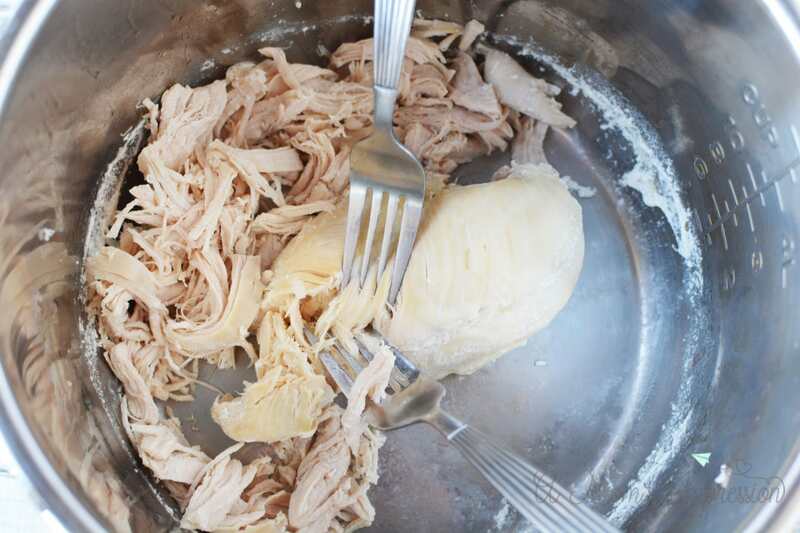 Once you realize how easy it is to make shredded chicken you will be doing it all the time as we do. Basically, you are going to put a cup of water into your pressure cooker and add your chicken breasts. You can do this for both fresh or frozen chicken. You can use a trivet, but I find it much easier and less to clean if I just simply place the chicken into the bottom of the pot with the water. Then you push the poultry button if you have one, or set your pressure cooker for manual high for 10 minutes. Let the pressure release naturally and then shred your chicken. It is that easy! Place 1 cup of water into the Instant Pot. Place chicken in the pressure cooker. Place the lid on the instant pot and seal shut. Close the pressure release valve. Set the Instant Pot to manual, high pressure for 10 minutes. When the cooking cycle is complete, let the pressure release naturally and open the Instant Pot. Remove chicken. Carefully reserve 1/2 cup of water/drippings and discard the rest. Return 1 breast at a time to the pot and shred with two forks. Continue until all chicken is shredded. Sprinkle with taco seasoning and add reserved water/drippings. Stir to mix well and set the pot to saute. Cook just until chicken is heated. Serve on taco shells with your favorite toppings. When the cooking cycle is complete, let the pressure release naturally and then open the Instant Pot. Remove the chicken. Carefully reserve 1/2 cup of water/drippings and discard the rest. Return 1 breast at a time to the pot and shred with two forks. Continue until all chicken is shredded. Sprinkle with taco seasoning and add reserved water/drippings. Stir to mix well and set the pot to saute. Add the chicken back into the pot and cook just until chicken is heated. Place chicken into taco shells and top with your favorite taco toppings. Enjoy! *Calorie count does not take into consideration your tortilla shells or any toppings. The cooking time does not include the time it takes for your pressure cooker to come to pressure.